Here at The Accordion Shop we offer a full accordion repair and restoration service. We work closely with several professional and highly experienced technicians around the country, who are able to repair any type of accordion, concertina, melodion or any other free reed instrument. We also have links with a former workshop manager of Hohner, with whom we specialise in fully restoring and selling classic Hohner accordions from the 1960’s and 1970’s. 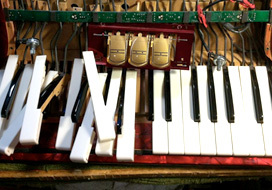 In addition to repairs, we are also able to fit internal microphones and/or full or partial midi systems to any make and model of accordion. Please contact us for a personalised quote. If you have an accordion that has seen better days, then why not bring it in to either our Sunningdale or Rochdale store for us to assess. However, please do contact us first before travelling, so we can make sure that the appropriate person will be around to meet and assist you. Please note that due to the individual nature of accordion repairs and restoration, we are unable to give quotes or offer any advice over the phone or via email, as we will always need to physically see and play the instrument in store.